00:10.2	and I'm a professor at Stanford University. 00:32.3	of relatively small and simple subunits or parts. 00:43.1	It also happens to be my favorite protein. 00:47.2	not particularly distinguished in terms of its overall shape. 00:50.0	It has the capacity to bind and hydrolyze ATP. 01:15.2	by Santiago RamÃƒÂ³n y Cajal. 01:33.0	- 10^4 or 10^5 orders of magnitude larger. 02:06.2	is a tiny little pair of bacteria. 02:18.3	so it's chasing after that bacterium. 02:32.2	which is its biological function. 02:42.2	we can find examples like this amoeba. 02:54.2	to the movement of the human neutrophil. 02:57.2	to tell the difference between these two different cells. 03:01.1	have been separated by about two billion years of evolution. 03:14.1	has also been conserved all of this time. 03:23.2	as I just told you about. 03:37.2	and see their overall distribution. 03:43.0	towards the leading edge. 03:54.1	these actin filaments actually are. 04:13.0	that is able to push the cell forward. 04:29.1	is just with the filament itself. 04:42.1	in order to make a filament. 04:51.2	and that's the fact that it's able to bind and hydrolyze nucleotide. 05:01.1	it has a propensity to assemble into filaments. 05:10.0	the ATP is converted to ADP. 05:16.3	and those monomers are able to come off again. 05:35.2	that we'll be talking about. 05:44.1	it's nucleation that's the rate-limiting step. 06:01.0	that will allow filament elongation to begin. 06:08.2	equilibrium is never reached inside of a cell. 06:12.0	are always constantly turning over. 06:25.1	where the actin filaments are relatively static. 06:31.1	associated with the filament structures. 07:02.2	there's probably some protein out there that does it. 07:19.2	can generate physical force. 07:29.1	of that particular kind of motion. 07:38.1	can actually lead to physical force. 07:51.1	and a free subunit. 07:53.1	Those are going to be the reactants. 08:14.1	That stands for critical concentration. 08:30.1	what's illustrated at the top here. 08:38.2	then those filaments will tend to polymerize. 08:49.3	is gonna be negative overall. 09:20.2	and the barrier will be pushed forward. 09:36.1	can be used to generate force. 09:43.0	that can be generated by polymerization of a filament. 09:53.2	or the equilibrium binding constant. 10:12.1	like myosin or kinesin. 10:21.3	as something like myosin. 10:29.0	is a little bit different from thinking about the energetics. 10:47.1	and then push the barrier. 10:53.2	and different components of the system. 11:04.2	maybe can move their angles. 11:29.1	as it's chasing a bacterium. 11:49.1	were able to actually measure the force of actin polymerization directly. 12:04.0	can grow actin filaments off of one tip. 12:26.3	and bring it up against a microfabricated wall. 12:48.2	and push the bead out of the trap. 13:09.2	by the pushing against the wall. 13:23.1	under the conditions that we used. 13:46.2	that are operating over a very large area of space. 14:01.1	and that's actually the field of bacterial pathogenesis. 14:16.3	actually turn out to be excellent cell biologists. 14:43.1	is this organism here, Listeria monocytogenes. 15:09.0	that line our intestines. 15:18.2	the infection can actually spread throughout the entire body. 15:32.2	about five hours before this movie was made. 16:00.0	is driven by the assembly of host cell actin filaments. 16:11.3	that is the actin left behind the bacterium as it moved. 16:28.2	have been labeled in green. 16:50.0	and records the path it traveled over. 17:11.3	to push the bacterium through the cytoplasm of this host cell. 17:28.2	as a history of where a bacterium has moved. 17:34.1	the old filaments fall apart. 17:46.2	where they can continue to generate force. 17:59.0	to both biophysical and biochemical manipulation. 18:09.1	more than 20 years ago now. 18:29.1	that had all been completely identified. 18:38.3	which you see... sorry, which you see right here. 18:50.2	that looks very much like the comet tail associated with a real bacterium. 19:01.1	and in fact look exactly like the bacteria do. 19:08.0	with these artificial substrates. 19:23.2	and figuring out how they all work together. 19:52.2	in apparently completely unrelated strains of bacteria. 20:06.1	and remember that nucleation is the rate-limiting step. 20:26.2	in a branch off of the side of that old actin filament. 20:36.1	it's thought to work by a very similar process. 21:02.1	or any of its relatives in this process. 21:41.2	in a cytoplasm that has these factors in there. 21:49.3	there are several things about it that I still find absolutely astonishing. 22:10.3	that are only about 4 nanometers in diameter. 22:15.3	is that fast, is that slow? 22:21.2	about what's fast or slow. 22:31.2	of the Ohio class nuclear submarine. 22:36.2	that's capped on two ends with hemispheres. 22:39.3	it leaves behind these characteristics curving patterns behind it. 22:50.2	is about 30 feet/second. 22:54.3	to be as big as the submarine. 23:02.2	or about a foot across. 23:19.2	and its speed would be about 50 feet/second. 23:22.1	So, it can just as fast as the submarine. 23:35.3	to the movie that I showed you before of Listeria motility. 23:40.0	just scaled up massively. 23:43.3	is the submarine is just moving through water. 24:00.2	it's not like a submarine moving through water. 24:16.1	in its comet tail. 24:22.2	how much force is actually being generated. 24:37.3	so you see them in green. 24:46.2	and remember, mitochondria are about the same size as bacteria. 24:52.2	so this is a pretty equal battle. 25:04.1	and it just slices its way through that big pile of mitochondria. 25:07.2	even slowing down at all. 25:12.3	out of the way. 25:36.2	and stuck it on the end of an AFM cantilever. 25:52.1	and therefore also measure the force. 25:56.2	there's a couple of things that are very astonishing about them. 26:05.2	is on the order of about 300 nanoNewtons. 26:15.2	in order to generate tremendous amounts of force. 26:46.0	or in the cell against the surface of a bacterium. 27:07.3	such as pushing a bacterium around inside of a cell. 27:18.2	at the leading edge of a crawling cell. 27:36.2	inside of the cells or in extracts. 27:46.0	please come back for part 2. 27:53.1	that I've had working on this project, now, for many years. 28:11.0	and also by Dan Fletcher. 28:15.0	of just absolutely wonderful collaborators. 28:23.3	on all of these processes associated with Listeria motility. 28:27.0	Thank you very much for your attention. 00:07.2	Hello. I'm Julie Theriot. 00:10.0	I'm a professor at Stanford University. 00:19.1	of rapid cell motility. 00:27.1	that comes from the skin of fish, called a keratocyte. 00:35.1	of the actin cytoskeleton throughout the cell. 01:00.2	that you see in rapidly moving cells. 01:21.3	that we see associated with cell motility. 01:34.3	where a number of different proteins will work together. 01:52.2	and how they're thought to work together. 02:04.2	at the very leading edge. 02:31.0	with respect to one another. 02:38.2	a very small zone right at the back of the cell. 02:48.1	seem to be coordinated with one another. 03:01.2	the adhesions at the rear. 03:16.2	without changing its size. 03:34.1	but even any of these individual assemblies on their own. 03:48.2	and how we isolate them. 04:01.2	for very rapid wound healing. 04:20.1	right along the edge. 04:29.2	so it doesn't cause any significant damage. 05:01.1	buzzing around more or less on their own. 05:12.2	once they break away from that epithelium. 05:19.1	for studying the mechanics of cell motility. 05:21.2	They move extremely fast. 05:23.1	They are among the fastest animal cells that are known. 05:30.0	which is very well illustrated by the cell over here. 05:45.3	that it just keeps right behind it. 05:56.1	So they're essentially moving at steady state. 06:04.1	of the kind that I'm going to be delving into today. 06:27.1	in this coordination quite a lot. 06:33.1	that are adhering the cell to its substrate. 06:51.3	that are being organized by the myosin. 07:05.0	and the the cell body can rise up several microns high. 07:27.2	that is, it has to distinguish its front from its back. 07:37.0	is thought to be driven by actin polymerization itself. 07:53.2	the adhesions that are at the back. 08:09.0	- you don't actually need any contributions from the cell body. 08:34.2	as the whole cell was when it was intact. 08:40.2	that was done by my student Erin Barnhart. 08:48.3	with all of these dynamic cytoskeletal structures inside of it. 08:54.2	it's got a clear front and a clear rear. 09:02.0	this crawling lamellipodial fragment into two bits. 09:11.2	that's too small to movie. 09:26.1	that are necessary for persisten motility. 09:41.2	and those are all illustrated here. 09:51.2	by tension in the plane of the membrane. 10:06.1	as we'll see in a little bit more detail. 10:14.0	and then disassembled in the back. 10:18.2	primarily acting at the back. 10:32.3	to deliver components up to the front of the leading edge. 10:53.1	over such a large scale. 11:07.3	were dependent on what other aspects. 11:22.2	that was originally developed by Clare Waterman. 11:35.1	you instead see this little speckly, textured pattern. 11:58.1	from its own point of view. 12:06.1	how everything inside the cell is moving. 12:21.2	where the myosin is able to contract it. 12:45.2	depend on the location inside of the cell. 13:02.0	inward sweeping driven by myosin. 13:13.1	and then disassembling under the cell body. 13:26.1	how they responded to changes in their environments. 13:41.1	of the substrate that the cells were crawling over. 13:51.1	or in fact on the surface of an aminal. 14:11.1	because it can't quite get a grip on its surface. 14:28.0	that seem to sweep sideways. 14:51.2	mechanical cues in the form of the stickiness of the substrate. 15:00.3	mostly have to do with surprising roles for myosin. 15:12.1	relative to one another. 15:39.2	that are much more similar to the organization inside of muscle. 15:55.2	right on either side of the cell body. 16:00.2	now let's go back to this question of assembly and disassembly. 16:17.2	takes place over the context of the whole cell. 16:33.3	right on either side of the cell body. 16:40.1	very similar to the locations where we found myosin. 16:45.0	of mysoin II in these cells. 16:48.2	with myosin light chain carrying YFP. 16:58.3	that is, bipolar filaments that have been assembled. 17:17.0	and making these bundles that go from one side to the other. 17:34.1	for example, by inhibiting the motor activity of myosin. 17:46.3	using, directly, its force-generating capabilities. 17:58.1	he used extracted cytoskeletons. 18:19.1	including actin monomers, ATP, everything else. 18:32.1	to those extracted cytoskeletons. 18:44.2	drive destruction of the actin filament network. 18:57.2	right where the myosin is located. 19:05.2	when the myosin was activated. 19:16.1	when it gets to the back of the cell. 19:45.3	that are of more favorable geometry for force generation by myosin. 20:00.1	is enough to rip that network apart. 20:07.1	from the front of the cell to the back of the cell. 20:12.2	and for myosin to destroy the network. 20:45.0	and then also their shape. 21:07.2	it will grow back to exactly the same shape it was before. 21:24.0	and those are also the fastest moving cells. 21:37.1	and in a less persistent manner. 21:45.1	we call decoherent cells. 22:04.2	to give overall cell shapes. 22:22.2	the rounder, more D-shaped cells. 22:37.1	and membrane tension restraining the actin polymerzation. 22:55.2	and also move slower. 23:09.1	change across this entire shape spectrum. 23:19.3	was simply to lower and raise the temperature. 23:40.3	and the cell is moving slower and slower. 23:57.2	but it also assumes a wider shape. 24:18.1	is simply how fast the actin is polymerizing. 24:31.2	with many other motile cells. 24:38.2	and will head in one direction. 24:52.2	as the electric field was switched from one direction to the other. 25:06.2	and you can see the cell is following that line. 25:15.1	and is now heading back in the other direction. 25:22.2	and now heads back in the direction that it has been told to go. 25:38.2	so that they're able to turn. 25:44.2	and he found a couple of interesting things. 26:10.1	and it's characteristic of slow motion. 26:18.2	that we associate with fast motion. 26:34.0	than the other side. 26:42.2	is the left-right distribution of myosin. 26:50.2	and those two spots aren't always necessarily equal in size. 27:01.0	and a much higher amount of myosin in the spot on the right side. 27:12.2	and is therefore sweeping around the outside part of the turn. 27:27.2	through the mechanism of myosin action. 27:40.0	starts to flow at a slight angle. 27:47.2	at the outside corner of the cell. 27:57.1	and help the cell sort of flip around. 28:11.1	and where you have faster motion. 28:26.0	until it's then forced to turn in another direction. 28:40.0	that help the cell move overall and that help coordinate the front and the back. 28:47.2	left-right aymmetries that help the cell to turn. 29:03.1	that are doing more complicated tasks. 29:16.2	bacteria that are invading the human body. 29:35.2	in moving versions of the cell. 30:08.3	and is able to actually phagocytose and engulf them. 30:13.0	neutrophil-behaving tissue culture cell. 30:30.2	but also much, much more dynamic. 30:38.1	as the cell is crawling around. 30:49.1	as far as quantitative analysis goes. 30:59.1	so we can actually watch changes over time. 31:19.1	and the amount of retraction of its body. 31:33.2	and see how that changes as the cell moves around. 31:38.1	is that the myosin localization itself is also very dynamic. 31:47.2	or will move to a different location within the cell. 32:06.0	after the initial movement of the leading edge. 32:20.1	and the myosin is then reacting. 32:27.2	to pull the back together. 32:30.2	it's doing more of an inchworm motion. 32:34.2	How does this affect cell turning? 32:48.3	with respect to its immediate orientation. 33:12.0	the myosin then changes which side of the cell it's on. 33:30.1	versus when the myosin accumulates on the outside of the turn. 33:50.1	so that the whole cell is now oriented in the proper direction. 34:05.2	is that they're strikingly similar. 34:22.1	that can lead to turning. 34:27.0	in both the keratocytes and the neutrophils. 34:43.1	very, very sticky substrates. 34:52.1	where everything is happening at the same rate? 35:03.0	these guys now are moving at steady-state. 35:16.0	in terms of their overall shape or overall behavior. 35:27.0	you can see, really, how constant this speed is over time. 35:37.1	to behave more in a steady-state like keratocytes. 35:51.3	that use actin polymerization to drive their movement. 36:07.2	like steer them and determine their shape. 36:20.1	and to asymmetries that lead to cell turning. 36:27.0	between fish skin keratocytes and human neutrophils. 36:46.1	and also our wonderful collaborators. 36:56.2	that has driven the thought processes behind our experiments. In Part 1 of her video, Dr. Theriot explains how tiny, nanometer sized actin molecules can self-assemble into filaments that are hundreds of microns in length. These actin filaments are constantly growing and shrinking, and this dynamic behavior allows a network of actin to generate enough force for cell motility. The intracellular bacterial pathogen Listeria monocytogenes uses actin polymerization to propel itself through the cytoplasm and to invade other cells. Many years of studies using Listeria have allowed Theriot and others to dissect the regulation of actin network growth in Listeria “comet tails” and at the leading edge of crawling cells. In her second lecture, Theriot explains that fish keratocytes are an excellent system to study rapid cell motility. By labeling actin and myosin in keratocytes, Theriot and her colleagues were able to follow turnover of actin in the lamellipodium. Unexpectedly, they found that myosin II plays in important role in actin disassembly at the rear of the cell and asymmetric localization of myosin at the back of the cell appears to govern cell turning. Similar mechanisms of actin and myosin cooperation seem to drive rapid movement in both fish keratinocytes and human neutrophils. It has been known since the early 1990s that bacteria have homologues of both actin and tubulin. In general, however, bacteria are much simpler than eukaryotes. 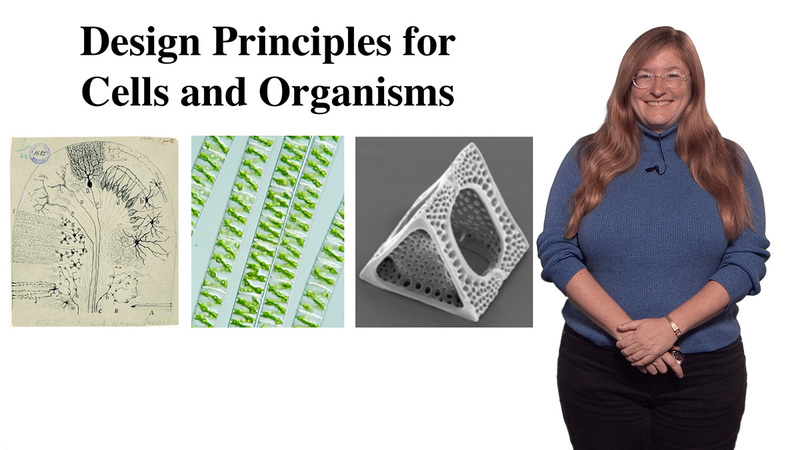 In her final lecture, Theriot speculates about the factors that have evolved to allow eukaryotes to modify their cytoskeletons and build bigger, morphologically complex, multicellular organisms. Alberts B, Johnson A, Lewis J, Raff M, Roberts K, and Walter P. (2002) Molecular Biology of the Cell 4th Edition, New York: Garland Science. Chapter 16. Cameron LA, Giardini PA, Soo FS, Theriot JA. (2000) Secrets of actin-based motility revealed by a bacterial pathogen. Nat. Rev. Mol. Cell Biol. 1:110-9. Pollard TD, Blanchoin L, Mullins RD. (2001) Actin dynamics. J Cell Sci. 114(Pt 1):3-4. Mogilner A, Oster G. (2003) Force generation by actin polymerization II: the elastic ratchet and tethered filaments. Biophys J. 84:1591-605. Hamon M, Bierne H, Cossart P. (2006) Listeria monocytogenes: a multifaceted model. Nature Rev. Microbiol. 4:423-34. Wilson CA, Tsuchida MA, Allen GM, Barnhart EL, Applegate KT, Yam PT, Ji L, Keren K, Danuser G, Theriot JA. (2010) Myosin II contributes to cell-scale actin network treadmilling through network disassembly. Nature. 465(7296):373-7. Keren K, Pincus Z, Allen GM, Barnhart EL, Marriott G, Mogilner A, Theriot JA. (2008) Mechanism of shape determination in motile cells. Nature. 453(7194):475-80. Yam PT, Wilson CA, Ji L, Hebert B, Barnhart EL, Dye NA, Wiseman PW, Danuser G, Theriot JA. (2007) Actin-myosin network reorganization breaks symmetry at the cell rear to spontaneously initiate polarized cell motility. J Cell Biol. 178(7):1207-21. Garner EC, Campbell CS, Mullins RD. (2004) Dynamic instability in a DNA-segregating prokaryotic actin homolog. Science. 306:987-9. Cabeen MT, Jacobs-Wagner C. (2010) The bacterial cytoskeleton. Annu Rev Genet; 44: 365-92. Marshall WF, Young KD, Swaffer M, Wood E, Nurse P, Kimura A, Frankel J, Wallingford J, Walbot V, Qu X, Roeder AH. (2012) What determines cell size? BMC Biol.10:101. Theriot JA. (2013) Why are bacteria different from eukaryotes? BMC Biol.11:119.